My assignment for one of the nights on our camping trip was to bring dessert and these were the first things to pop into my head. 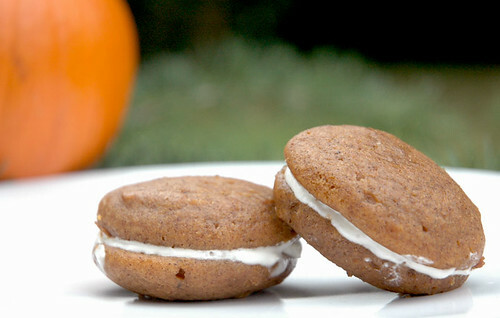 I have seen whoopie pie recipes floating around the internet for a while and have been very intrigued. When I saw this recipe I immediately knew that this was the one that I needed to try first. They are kinda like an inside out cupcake since the cookies are very moist and cake like and the filling is basically a butter cream cheese frosting. The cookies have the perfect blend of spices to compliment the pumpkin and the filling is so sweet and delicious with the pumpkin flavors. These were gobbled up quickly and everyone enjoyed them a lot. Preheat oven to 350 degrees F. Line baking sheets with parchment paper or a silicone baking mat. In a large bowl, whisk together the flour, cinnamon, baking powder, baking soda, salt, ginger and nutmeg. Set aside. In a separate bowl, whisk the granulated sugar, the dark brown sugar, and the oil together. Add the pumpkin puree and whisk to combine thoroughly. Add the eggs and vanilla and whisk until combined. Gradually add the flour mixture to the pumpkin mixture and whisk until completely combined. Use a small cookie scoop or a large spoon to drop a rounded, heaping tablespoon of the dough onto the prepared baking sheets, about 1 inch apart. Bake for 10 to 12 minutes, making sure that the cookies are just starting to crack on top and a toothpick inserted into the center of a cookie comes out clean. The cookies should be firm when touched. Remove from the oven and let the cookies cool completely on a cooling rack. To make the filling, beat the butter on medium speed until smooth with no visible lumps, about 3 minutes. Add the cream cheese and beat until smooth and combined, about 2 minutes. Add the powdered sugar a little at a time, then add the maple syrup and vanilla and beat until smooth. To assemble the whoopie pies: Turn half of the cooled cookies upside down. Pipe or spoon the filling (about a tablespoon) onto that half. Place another cookie, flat side down, on top of the filling. Press down slightly so that the filling spread to the edges of the cookie. Repeat until all the cookies are used. Put the whoopie pies in the refrigerator for about 30 minutes to firm before serving.